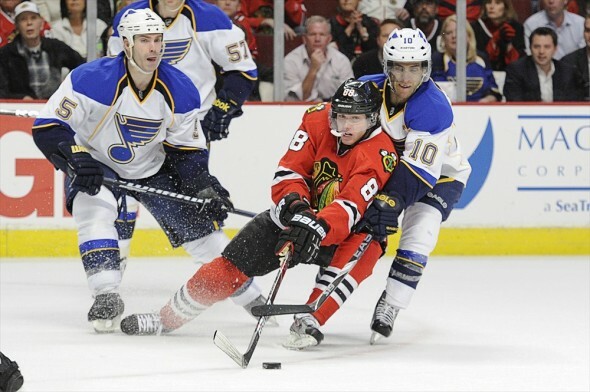 The Chicago Blackhawks had a tough time transitioning from 2011 to 2012, going 9-13-3 to open up the new year. The Hawks were losers of 9 straight games from January 21st to February 14th and could not find any sign of consistency from their goaltenders, Cory Crawford and Ray Emery. Rumors swirled around the February 27th trade deadline regarding a possible trade for a veteran goaltender by General Manager Stan Bowman–Nothing happened. To make matters worse, its captain and arguably best player, Jonathan Toews, has been sidelined since February 19 with a concussion . It appeared as though there would be no “Chelsea Dagger” playing in the United Center come April. Fast forward to March, where the Hawks are winners of 4 straight games, and are currently the sixth seed in the very tight Western Conference race. Chicago is 8-1-1 in its last 10 games, and beginning to get hot at the perfect time with the playoffs right around the corner. Patrick Kane has upped the ante in the absence of Toews, assuming the top center position playing on a line with Andrew Brunette and Marian Hossa. Hossa has taken the brunt of the scoring role, racking up 6 goals and 9 assists since Toews was sidelined, and Kane has chipped in with 10 pts. Hossa is nearing his eighth 30 goal season of his career, but only his first with the Hawks. The other Patrick, Patrick Sharp, has 13 pts in his last 14 games and reached the 30 goal mark for the third time in his career last night in a win at Columbus. Chicago has begun to tighten up its play in the defensive zone, an area of weakness for much of the season. The addition of Johnny Oduya at the trade deadline has paid big dividends for Joel Quenneville’s team. Oduya has played 20 plus minutes in every game he has played in since joining the Hawks, and scored the go-ahead goal in a big match up against the New York Rangers. Cory Crawford is making his bid to be the starting goaltender in the playoffs. Over his last 5 games Crawford has posted a 5-0 record with a 1.40 GAA and a saver percentage of .925. It has been a rollercoaster season for Crawford, but if he continues his hot play, Chicago could return to the Stanley Cup Finals. The Central Division has arguably been the best division in hockey this season with the likes of the rejuvenated St. Louis Blues, defensively stout Nashville Predators, and the savvy veteran Detroit Red Wings. Chicago is only 2 pts out of a tie for fourth with the Predators and the slumping Red Wings. The Hawks have been a much better home team this season (25-7-5) than on the road (16-18-3). Securing the fourth seed and home ice advantage in the first round would be a major advantage, especially in a Central Division match up with Nashville or Detroit. The remaining schedule for the Hawks is difficult as they face 5 playoff bound teams to finish the season, including 2 games against St. Louis and 2 against Nashville. They close out the season with a big game at Detroit with serious playoff implications on the line. Next up, the Vancouver Canucks come to Chicago tonight for another match up between these hated rivals.